The only slowdowner that automatically detects and displays key, tempo and chords for you to use. Fully functional, 4 hour demo, with no calendar expiration. Sufficient time to change key/tempo on more than 50 songs. Virus/malware scanned. Clean install with NO co-installation of other programs. We PROTECT your personal information and do not sell, rent, or giveaway your email address. I encourage you download our free demo right now, and give Song Surgeon a try today. 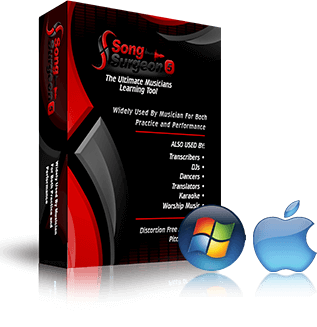 Find out why Song Surgeon is now used in more than 120 countries worldwide to achieve high quality key and tempo change.